* Phoenix was named the #2 videogame book of all time. was named the #5 videogame book of all time. · Leonard Herman has done it again. · Phoenix is a must-read, must-study, must-own for anyone proclaiming a love for the gaming industry. · Phoenix is one of the most impressive and comprehensive accounts of the history of video games. · Phoenix is the cornerstone upon which every serious videogame enthusiast should start building their own library. ·The video game industry has a history of record. Its title is Phoenix. ·An incredible treasure trove of information. ·Young or old, gamers will no doubt appreciate the effort poured into this massive book. · People calling themselves 'game historians' today should be using Phoenix as their backup for fact-checking. ·Phoenix is where the serious study of the game industry began. ·This is the book that experts, such as myself, respect and use as a resource. · Phoenix (in any of its editions) is still the first place to start any study of gaming history. 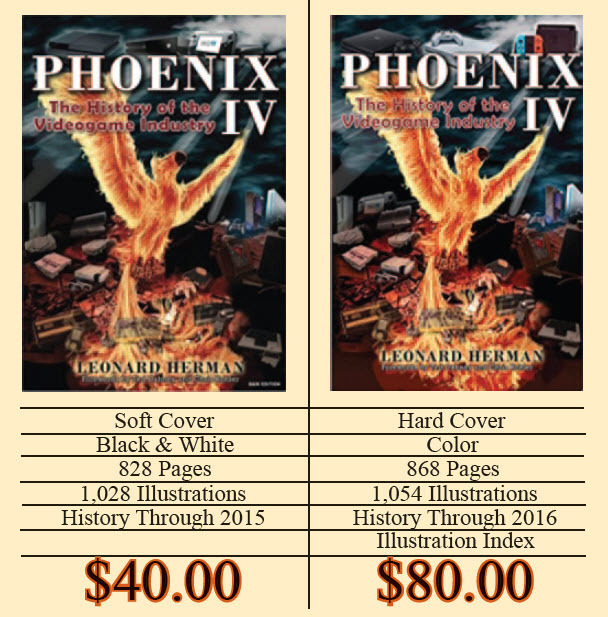 · Phoenix is the most fascinating book to ever tackle the subject. · Phoenix 4 (and all future updated editions) will remain the definitive text on this part of video game history.